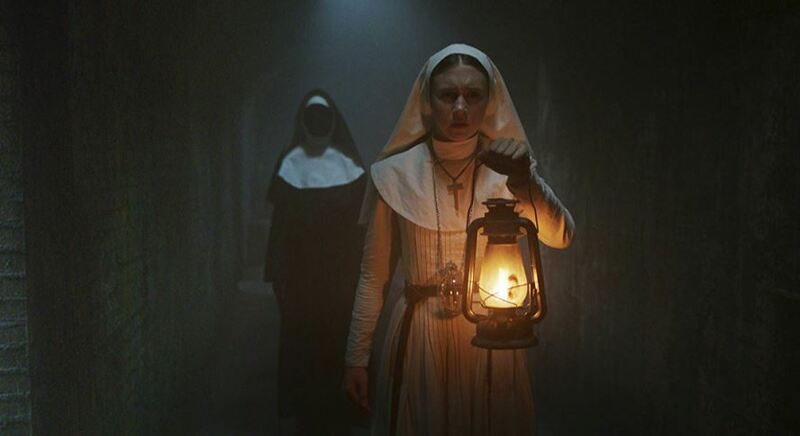 AICN's Eloy Reviews "THE NUN"
Here with a returning contributor Eloy Ricardo Balderas Salazar and his review of "The Nun." Here it is folks! THE NUN is a bad movie even objectively speaking, I think. Which is not to say that I didn´t- nor that, for that matter, many of you won´t- enjoy it at least up to a point. How much exactly will greatly depend on how much leeway you are willing to grant director Corin Hardy’s aesthetic vision given that the film’s greater strengths and weaknesses at no point really extricate themselves from the most basic, visceral necessities of a horror movie- as, probably, most of them should. I granted it quite a bit myself. The movie is an unrepentant, shameless amalgam of the most classic of horror film tropes, so blatant that a less forgiving moviegoer would bluntly, simply call it a manic barrage of cliches. However, for me, Hardy’s highly focused use of the talents of Alexandre Aja’s longtime cinematographer Maxime Alexandre and Production Designer Jennifer Spence (a trusted staple in New Line Cinema and James Wan’s most recent releases) not only stopped short of parody- barely. They managed to convey honest admiration and outright love for the sort of iconography indelibly etched onto the mainstream’s consciousness by Universal Studio’s classic monster entries and Hammer Films’ Poe adaptations and vampiric tales. Fog-soaked moors, makeshift graveyards crammed full with askew crosses, a castle of Dracula-like abbey perennially drenched by black ink shadows which the oil-lamps that our heroine- and everyone else- carry around at all times can’t dispel. Abel Korzeniowski’s divinely bombastic score feels lifted right out of Mel Brooks’ DRACULA: DEAD AND LOVING IT. 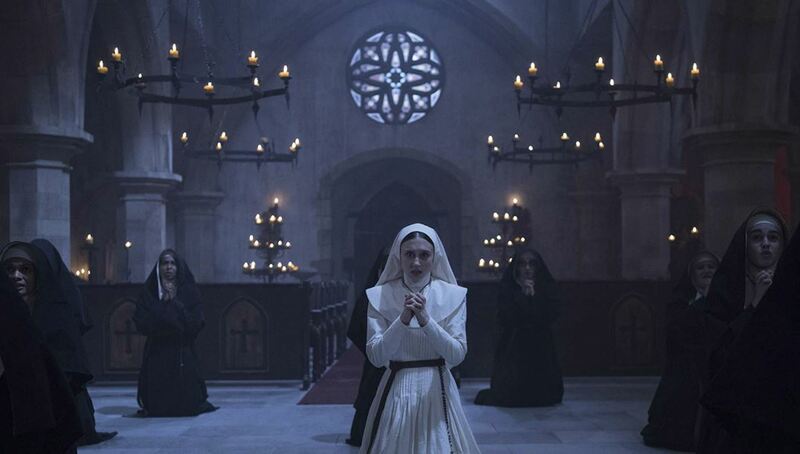 THE NUN is a visually gothic paradise. The tone stays in that realm for the most part, as well. The screenplay from Gary Dauberman- fresh off of IT’s unexpectedly staggering success- doesn´t do anything to elevate the penny dreadful-worthy setup- if anything it aims to provide a summer blockbuster-type core threat that feels disappointingly tone-deaf for this particular story- and that might even be for the best; as with the flagship efforts of this group of films now non-officially recognized and baptized as THE CONJURING Cinematic Universe the very best part of them come from both casting and performances. 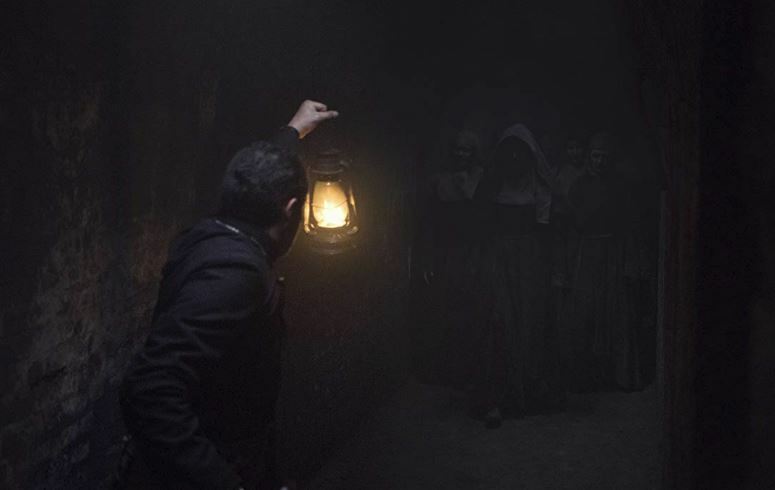 American Taissa Farmiga, Mexican Demián Bichir, and French Jonas Bloquet star as, respectively, the postulant, priest, and sidekick who travel down to a Romanian abbey to investigate possible paranormal happenings involved in the suicide of one of the nuns serving therein. Such is the plot and, miraculously, the movie kicks into high gear right from the get-go, mercifully sparing us the expected, trite introduction of the tormented man losing her family to a blood-thirsty killer before turning to priesthood or maybe, say, witnessing a close friend dying in an exorcism gone wrong (that, somewhat disappointingly, occurs later on). Sadly, Dauberman also forgets to give us some character insights or development as well and only uses precisely two scenes to let us know our novice heroine before placing her in a near permanent state of maddening fright- which she does admirably. It is a testament to Taissa Farmiga’s undeniable talent that those are enough to get us entirely onboard and on her side for the rest of the ride. Her sister Irene irradiates a clean, open luminescence that provides this movie with way more movie star charisma than it deserves and without which it would probably rest beyond any redemption whatsoever. Similarly, Bichir’s Father Burke literally asks nothing of him and wastes the talent he´s more than capable of displaying and has already offered, most notably in both his turns under Tarantino and Weitz’ direction. But, again, the weighty presence he´s been honing ever since arriving in Hollywood comes to the forefront and forces us to empathize as he becomes, by turns, curious, intrigued and scared witless. These are people we firmly root for and manage to turn the meat of the movie. A long stretch in the middle of the film was more concerned with oniric imagery and almost distraught storytelling. Rather than with the most basic senses of geography and common sense- turning the film into an amusement park ride preoccupied only with coming up with as many excuses as possible to force our heroes to slowly walk down pitch-black hallways for as long as we can withstand before being bombarded by the next jump-scare. It was fun enough for me.